Howard Y. McClusky, a Professor of Educational Psychology and Community Adult Education at the University of Michigan from 1924 until his death in 1982, examined adult learning as a person trained in experimental psychology. Throughout much of his career, he was concerned with finding ways to help adults maintain a positive approach to life (Hiemstra, 1980). Early in his career he worked primarily with youth and young adults. Then as he aged his concerns shifted to adults at later ages (Hiemstra, 1981). During his last decade plus he focused primarily on older adults. He introduced the Theory of Margin in the early 1960's (McClusky, 1963). He believed the theory was relevant for understanding adults lives, especially as they aged and various demands or pressures increased. Howard believed that being an adult means facing continuous growth, change, and integration, in which constant effort must be made to use the energy available for meeting normal living responsibilities. However, because people have less than perfect control over many aspects of their lives, they must find ways to be prepared to meet unpredictable crises or problems. According to McClusky (1974) in his theory of Power-Load-Margin, the key factors of adult life are the load the adult carries in living, and the power that is available to him or her to carry the load. Margin was conceived of as a formula expressing a ratio or relationship between the "load" (of living) and the "power" (to carry the load). According to McClusky (1970, p. 27), load is "the self and social demands required by a person to maintain a minimal level of autonomy.... [Power is] the resources, i.e. [sic] abilities, possessions, position, allies, etc. [sic], which a person can command in coping with load [sic]. In this formula for margin (M), he placed designations of load (L) in the numerator and designations of power (P) in the denominator (M = L/P). This formula clearly suggests that the greater the power in relationship to the load the more margin will be available. The load-power ratio changes and adjusts throughout the adult years with changes in any of the power or load factors. Surplus power provides a margin or cushion to handle load requirements. Margin can be increased by reducing load or increasing power. Howard suggests, subsequently, that if values could be assigned to load and power indicators, a resulting equation of somewhere between .50 to .80 would provide enough margin to meet the various emergencies that surface throughout life (1963). In other words, the more margin one has, the greater the chance of dealing with sources of load. The less margin one has, the lower the chance of dealing with sources of load. He further divided load into two groups of interacting elements, one external and one internal. The external load consists of tasks involved in normal life requirements (family, work, community responsibilities, and so forth). Internal load consists of life expectancies developed by people themselves, such as aspirations, desires, and future expectations. Power consists of a combination of such external resources and capacity as family support, social abilities, and economic abilities. It also includes various internally acquired or accumulated skills and experiences contributing to effective performance, such as resiliency, coping skills, and personality. Thus, a person's performance will be a function of various load dimensions and values, as well as a capacity to carry the load. Margin can be increased by reducing load or increasing power. McClusky (1963) suggested that surplus power is always needed to provide enough margin or cushion to meet various load requirements and life emergencies. The theory also can serve as a guide to explain some of what is happening throughout life. McClusky (1963) believed the value of the theory was its usefulness in describing varying amounts of Margin that could be involved in adult adjustment. Such value is directly observable when applying the theory to learning activities by adults in their later years. This is when radical changes in the load-power ratio may take place due to declining financial resources, death of a spouse, and so forth. In McClusky's (1970, p. 146) words, "In the light of our theory therefore [sic], a necessary condition for learning is access to and/or [sic] the activation of a Margin of Power that may be available for application to the processes which the learning situation requires." Thus, a crucial element for meeting learning or other life demands is the ratio between load and power: "Whatever the load and whatever the power (up to a practical level), the crucial element is the surplus or margin of power in excess of load. It is this margin that confers autonomy on the individual, gives him [sic] an opportunity to examine a range of options, and enables him [sic] to reinvest his [sic] psychological capital in growth and development" (McClusky, 1974., p. 330). Frequently, learning during the adult years provides surplus power and becomes a major force in achieving various goals. Margin theory also can be used as a research framework. For example, Baum (1978) studied widowhood and used Margin theory as a conceptual framework. Gessner (1979) used margin as a theoretical framework for studying nurses' participation in continuing education. Gleit (1976) used the theory to look at potential restrictions to participation in continuing education. Garrison (1986), James (1986), Mikolaj (1983), and Stevenson (1982) have attempted to measure aspects of power and load. Margin theory can be used as a basis for practical applications, too. Main (1979) conceptualized a teaching and learning model based on power and load notions. Hiemstra (1981) proposed a framework for planning educational programs based on load and power imbalances, including examples for how it could be used. 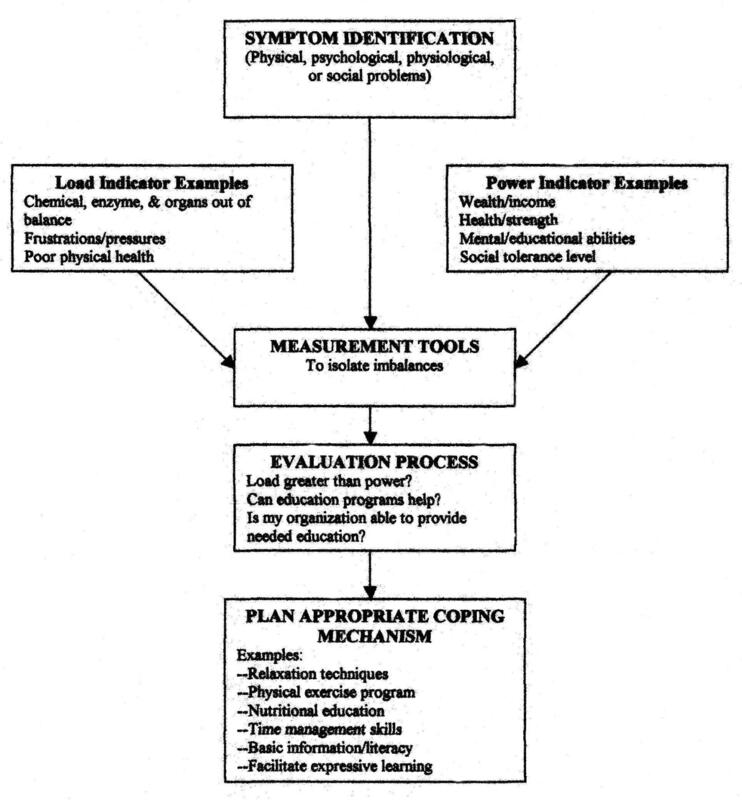 As another approach, Figure 1 provides some refinement suggestions for measuring, evaluating, and planning programmatic responses to load and power imbalances (Hiemstra, 1981). Obviously more research is needed to continue such refinement suggestions. In characteristically optimistic fashion, Howard provides the motivation for carrying out such refinements. He suggests that ages 0-25 are when margin is developed; ages 25-45 are when margin is expanded; beyond 45 is when what he calls the transvaluation of margin becomes possible: "this writer (McClusky) holds that by realigning and transvaluing the relationship of Load to Power, the later years may in fact be a period of progressive growth" (1970, p. 150). Figure 1. Suggested framework for planning educational programs based on load and power balances. One of the most surprising findings was that the attitudinal and behavioral dimensions of instructor-generated load were identified more than three times as often as the task dimension. This suggests that many adults adjust their margin to deal with the expected task demands assigned to them by instructors. But additional unexpected demands such as attitudinal and behavioral characteristics of instructors may cause unnecessary loss of energy needed to satisfactorily complete a learning objective. Thus, instructors should be aware of these potential sources of load since they are in a position to increase or decrease the effects of such factors. By attending to these items, you should be in a position to improve the teaching and learning satisfaction of your students, and make your job as instructor more satisfying, too. Baum, J. (1978). An exploration of widowhood: Implications for adult educators. In Proceedings of the Annual Adult Education Research Conference. San Antonio, TX. Day, M., & James, J. (1984). Margin and the adult learner. MPAEA Journal of Adult Education, 13(1), 1-5. Garrison, D. R. (1986). An analysis and reformulation of McClusky's concept of margin for predicting adult dropout. In Proceedings of the Annual Adult Education Research Conference. Syracuse, NY: Syracuse University. Gessner, B. A. (1979). Margin and its relationship to nurse's participation in continuing professional education. Unpublished doctoral dissertation, University of Wisconsin-Madison. Gleit, C. J. (1976). Effects of family composition on the North Carolina nursing force and their participation in continuing education programs. Unpublished doctoral dissertation, North Carolina State University at Raleigh. James, J. M. (1986). Instructor-generated load: An inquiry based on McClusky's concept of margin. Unpublished doctoral dissertation, University of Wyoming. Main, K. (1979). The power-load-margin formula of Howard Y. McClusky as the basis for a model of teaching. Adult Education, 30, 19-33. McClusky, H. Y. (1963). The course of the adult life span. In W. C. Hallenbeck (Ed. ), Psychology of adults. Chicago: Adult Education Association of the U.S.A.
McClusky, H. Y. (1970). An approach to a differential psychology of the adult potential. In S. M. Grabowski (Ed. ), Adult Learning and Instruction. Syracuse, NY: ERIC Clearinghouse on Adult Education. (ERIC Document Reproduction Service No. ED 045 867). McClusky, H. Y. (ca. 1974). Education for aging: The scope of the field and perspectives for the future. In S. Grabowski & W. D. Mason (Eds. ), Learning for aging (pp. 324-355). Washington, DC: Adult Education Association of the USA. Mikolaj, E. (1983). The intrapersonal role conflicts of adult women undergraduate students. In Proceedings of the Annual Adult Education Research Conference. Raleigh, NC. Stevenson, J. (1982). Construction of a scale to measure load, power, and margin in life. Nursing Research, 31 (4), 222-225.